“Redesigning a course is a complex task, and I have been very impressed with how the DELTA team is able to understand the issues and structure of my course and make very insightful and helpful suggestions,” said Teaching Assistant Professor Lina Battestilli in the Department of Computer Science. DELTA began working with Battestilli in the current grant cycle to transform her CSC 113: Introduction to Computing MATLAB course. 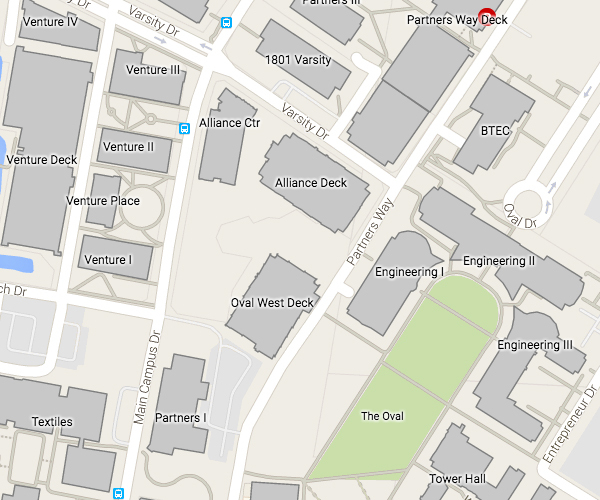 This is one of five courses in the Department of Computer Science that DELTA has redesigned through a Critical Path Course Redesign grant. Beginning in 2015, DELTA has worked on CSC 116 with Teaching Assistant Professor Jessica Schmidt; CSC 216 with Teaching Associate Professor Sarah Heckman; CSC 316 with Teaching Assistant Professor Jason King; CSC 326 with Teaching Associate Professor Sarah Heckman, Assistant Professor Chris Parnin, and Assistant Professor Katie Stolee; and CSC 113 with Teaching Assistant Professor Lina Battestilli to redesign the learning experience. Each redesign had a unique focus but aimed to support active learning, higher-order thinking, group collaboration and student success, for both current and future students. “Yet, it is incredibly important for students to do well in these courses. So, we help faculty streamline techniques like flipping the course by creating online activities to better prepare students for face-to-face activities and putting structures in place to support communication both online and face-to-face. We look at everything that is frustrating the faculty because of the size of the course and give them the tools to make it feel like a smaller course, not just for the students, but for the faculty as well,” Davis added. Battestilli’s CSC 113 course is a service course for College of Engineering students, usually Mechanical and Aerospace Engineering. The course redesign is using a flipped-learning approach to create more in-class time for problem-solving. According to Battestilli, students are required to do online learning before class to learn basic knowledge. Then, during the lecture, students are able to ask questions and work through more complex examples. “Nobody learns programming from just passive listening or observing. Therefore, the faster I can get the students working on problems and coding, the better the learning outcomes I can expect,” said Battestilli. “Flipping a course requires much more than creating online videos. It is about looking at the weekly learning cycles, teaching the students how to be successful in a flipped course format and creating active learning and problem-solving sessions to replace lecturing,” she added. A gamified “Learning Fitness” intervention is part of the solution to help students be successful in a flipped course format. This intervention helps support students’ self-regulation skills such as setting goals, managing study time, monitoring learning strategies and more. The DELTA team is also working on interview videos with professors, former students and industry professionals to help students understand the importance of computing in engineering and the usefulness of computing in the real world. Battestilli’s hope for the redesign is students will receive more hands-on experience in using computational thinking to solve engineering problems, and they can apply this knowledge in their upper-level classes and ultimately in their future jobs or graduate school. “Working with the DELTA team on a course redesign will give you a very unique and thorough review of your course. You will get many good ideas and support on how to implement these ideas. The DELTA team is very professional, highly productive and knowledgeable. There is no doubt your course will be better after a redesign,” said Battestilli. Taking it back to 2015 with the CSC 116 course redesign, the DELTA team worked with Schmidt to redesign her already flipped course to add more active learning components in class. To introduce students to the course and the flipped learning format, an orientation was created that explains the before, during and after-class learning expectations and provides tips for pre-lab and in-class learning. During class, the students work in groups on programming exercises that require critical and creative thinking skills. A TH!NK journal designed to guide the groups through the planning process (problem analysis, solution plan, sharing and extending) before doing any coding. At the end of the semester, students work on a comprehensive exercise in groups to apply the programming concepts and skills learned throughout the semester. They are provided with real-world programming scenarios and step-by-step software development processes, which are designed to prepare them for advanced learning in CSC 216. In Teaching Assistant Professor Jason King’s CSC 316: Data Structures and Algorithms course, students are learning various abstract algorithms, techniques and data structures and the processes that govern them. This course is required for computer science majors and minors. To help students understand the value of learning theories, King and the DELTA team redesigned to the course to make better connections between theories and practice. 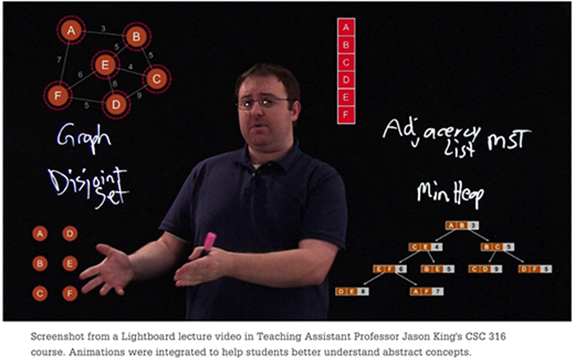 A variety of deliverables were created for the redesign including integrating animations into Lightboard lecture videos, which gives students new ways to understand difficult and abstract concepts. Since data structures are visual, these animations helped students see and understand the process. A Moodle peer review tool was used to facilitate software design proposal review among students before implementation and testing. With more than 200 students and four teaching assistants, this tool helped create a more seamless and easy-to-manage course. After the course redesign, DELTA’s Planning and Assessment team completed surveys that showed positive student learning outcome perceptions. 90% of students agree/strongly agree that the course projects were academically challenging and required them to think critically. In addition, the survey showed strong connections to prior CSC courses, an important outcome of the redesigned series. Teaching Associate Professor and Alumni Distinguished Undergraduate Professor Sarah Heckman has worked with DELTA on two Critical Path Course Redesign grants — CSC 216: Programming Concepts – Java in 2015-2016 and CSC 326: Software Engineering in 2018-2019. “The redesign of CSC 326 took advantage of things we had learned from earlier redesigns and was able to focus on collaboration and how to facilitate collaboration in student teams,” she added. For CSC 216, the goal was to incorporate a lab component as the course moved from three credit hours to four. Also, Heckman and team worked to transition from tutorials to guided projects to ease the transition between the prerequisite course CSC 116. “The key learning outcomes were integrated into weekly requirements, design, implementation and test cycles and the creation of library code that demonstrated a specific concept (like linked lists) was then utilized in the larger software system to demonstrate the use of that concept in practice,” Heckman explained. “By the end of the semester, students have created a system of around 10,000 lines of source and test code, which is a significant achievement for second-semester programming students,” she added. According to Heckman, after implementing the CSC 216 course redesign, the DFW (drop, fail, withdrawal) rate for the course went from an average of 27% in 2015-2016 to 20% in 2016-2017 and 16% in 2017-2018. In addition, according to DELTA’s assessment surveys, the majority of students (63%) viewed the lab as being beneficial for successful course completion, and 54% said the lecture/lab course format was more engaging than traditional lecture-only format. Students also showed a high level of confidence in their ability to complete course-related activities following completion of the course. 90% agree/strongly agree they are able to design and implement a finite state machine, for example. For CSC 326, the goal is to improve student outcomes around collaboration and teaming. From the first lecture, students participate in training activities on how to collaborate effectively as a team. Students worked on group projects that start with setting team goals and ground rules and integrate reflection on communication, teaming and feedback for their peers. Additionally, the course projects were redesigned to evaluate more than just the delivery of the final project. Students were also being evaluated on the process they use, project management skills, collaboration and peer evaluation, and review and inspection. “We are providing students more instruction about how to collaborate successfully and mechanisms for checking in with themselves and their teams about how the process is going. Students should be better prepared for Senior Design and future endeavors,” said Heckman. Using learner-centered pedagogical principles supported by interactive, computer-based materials and activities, we’ll work with you to transform the learning experience for your students. With a team of DELTA staff members from diverse disciplines, a Critical Path Course Redesign grant can help bring your ideas to life. Attend an in-person group consultation or an online informational session to learn more about DELTA Grants. Read the Critical Path Course Redesign RFP for specifics on the grant. The proposal submission system opens April 8 and proposals are due May 17 by 5 p.m.
Visit go.ncsu.edu/deltagrants for more information. View our DELTA Grants FAQ page for information about grant eligibility, the review process and general inquiries. DELTA staff members involved in the series of Critical Path Course Redesign grants for the Department of Computer Science include Yan Shen, David Tredwell, Ben Huckaby, Samantha McCuen, Rich Gurnsey, Chris Willis, Dan Spencer, and Kayla Briska.